Home Area Calculator using latest Google Earth Technology. Figuring out the amount of sod you need for your project can be a daunting and confusing task and we want to help! Enter the dimensions of the areas of your yard into our sod calculator below to determine the total square footage and number of pallets of sod to complete your project. Perennial Peanut and Paspalum are generally sold in 200-300sf pallets not the traditional 400sf that is our norm for traditional turfgrass pallets. Pots of Perennial Peanut plants are best planted on 18” centers. With 18” spacing you plants should grow together for full coverage in 9 to 12 months depending on the conditions and time of year they’re planted. 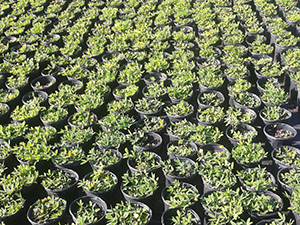 Use the calculator below to determine the number of plants needed for your project. 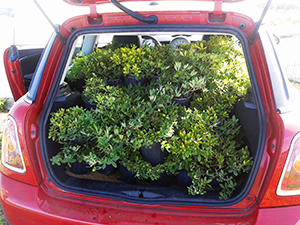 120 Ecoturf plants going home in a very cute Mini Cooper!